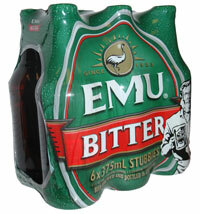 Emu Bitter began life in 1923, when it was first brewed as one of the flagship beers of the Emu Brewery based in Perth, Western Australia. Under the influence of former Head Brewer Ken Arrowsmith it has seen a surge in popularity since 1980s, and enjoys a fierce rivalry for the affection of Western Australians with Swan Draught. Emu Bitter is a bitter lager which pours light gold, with a mildly malty aroma. Its initial fizziness and grassy notes are followed by a finish which is distinctly hoppy. Its mid strength, and subtle flavours make it perfect as a thirst quenching, session beer. Enjoy cold.